Renovations are messy. A whole room of your home is emptied into random boxes in hallways and essentials are found on countertops in rooms that they don’t belong in. Every time we redo a new room, I get soooo frustrated by how cluttered the house gets before the renovations are done. 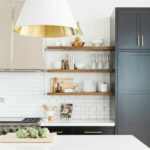 But then the clouds part and the sun shines through, and (if you planned your reno right), you suddenly have more storage then you’ve ever had! 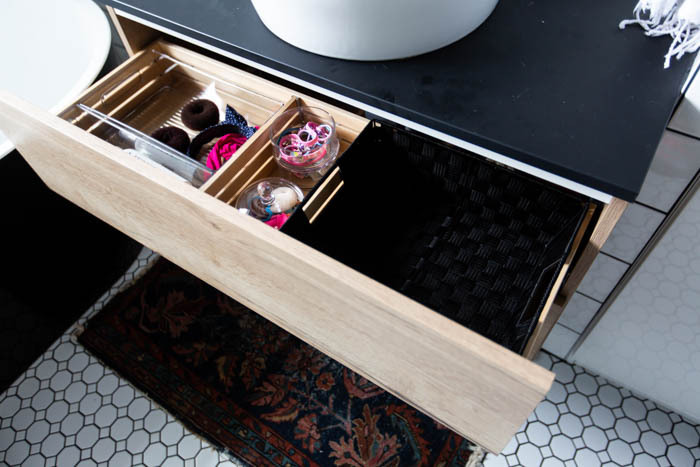 Ever since modern bathroom renovation finished, I’ve been itching to do some major drawer organization! My Modern Handmade Home friends and I have been busy organizing different spaces in our homes. Everything that was in our previous vanity, was piled in boxes. 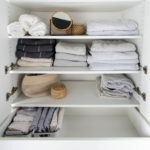 We also found that our home just did not have enough storage, so when we renovated the bathroom, we added these large wardrobes full of drawers and shelves to store all of our linens and “extras”. Now, a few months after the renovation, I’ve finally gotten the kick I needed to start with all of our new drawer organization! 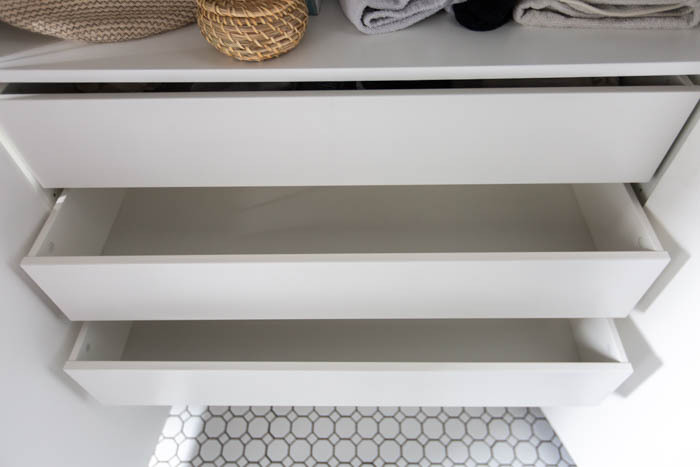 By now, you’ve probably all heard of Marie Kondo and her book, The Life-Changing Magic of Tidying Up. If you’re not a reader, you’re in luck, because she now has a show on Netflix as well, called Tidying Up. And I, for one, binge-watched the whole thing! lol. 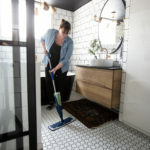 You’ll have to read the book or watch the show for yourself, but essentially she teaches people to declutter their homes by identifying that objects that bring them joy or “spark joy”. It’s so counter-intuitive to most people who declutter by trying to determine which things you no longer need or which ones to get rid off. Not only does she help you identify things you want to keep, but she teaches how to organize the things you do keep. 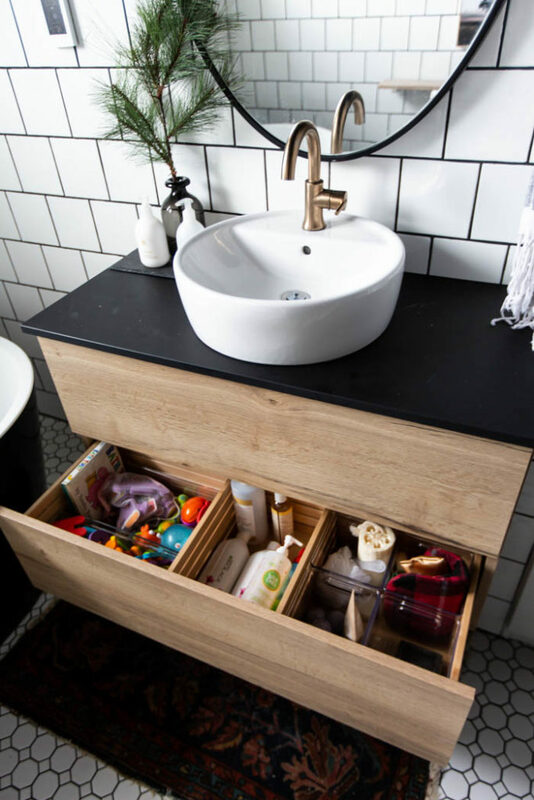 I used a little bit of my own organization methods, mixed with hers to organize this bathroom, and I have to say, it actually does bring me joy every time I open a drawer and see it all so nicely organized! It’s amazing! 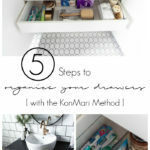 Now that I’ve gone through all of our bathroom supplies, purged and organized, I wanted to share five quick tips to help you get all of your drawers organized in a single afternoon too! 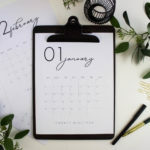 I’ve always been good at decluttering and purging items I no longer needed, but the idea of keeping items that bring me joy, was life-changing. 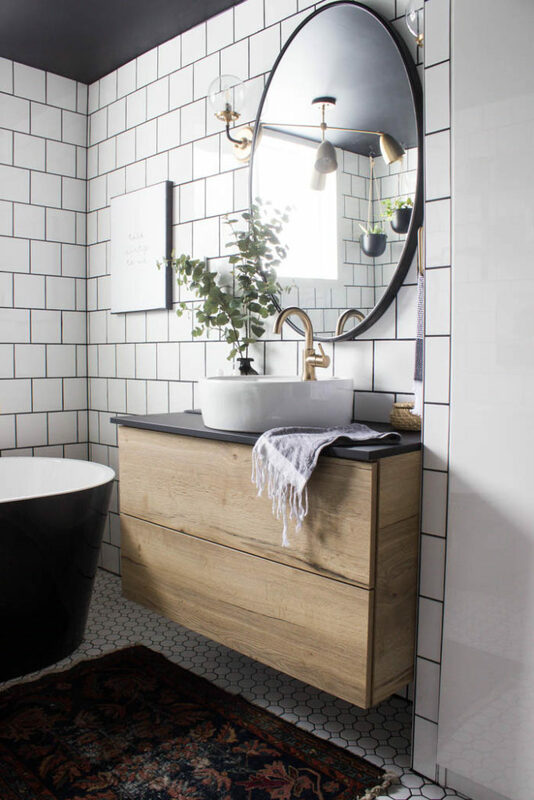 All of the sudden I had no need to hold onto all of those old, somewhat scratchy towels and unused soap bottles. 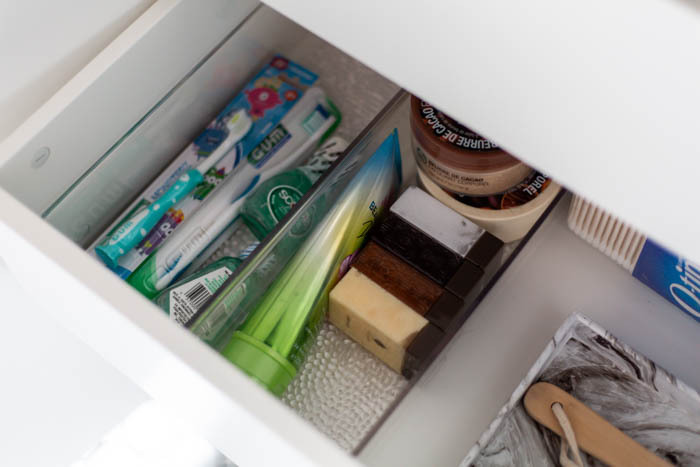 Of course, when it comes to the bathroom, there will probably be plenty of items that you need to keep (e.g. bandaids, bath toys, etc. 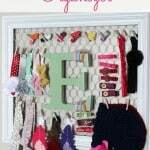 ), but there are great ways to organize them coming up too! 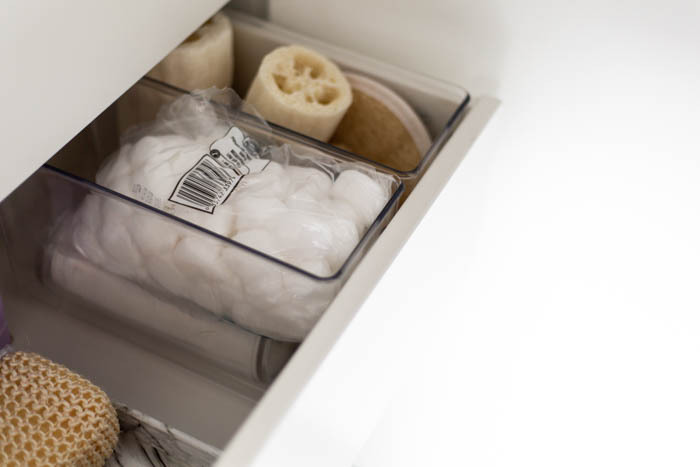 Ninety percent of the reason my drawers look so organized right now, it that I’ve used a ton of beautiful plastic bins from Kitchen Stuff Plus to separate everything. 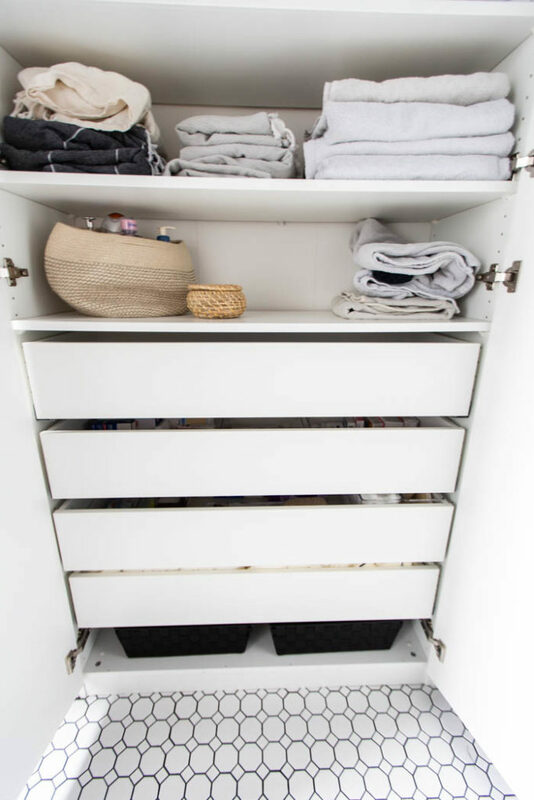 Boxes or bins compartmentalize everything easily, gives objects specific homes and is key to drawer organization. 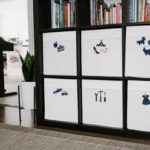 You can compartmentalize in two important ways: keep items of the same size together, and keep similar items together. 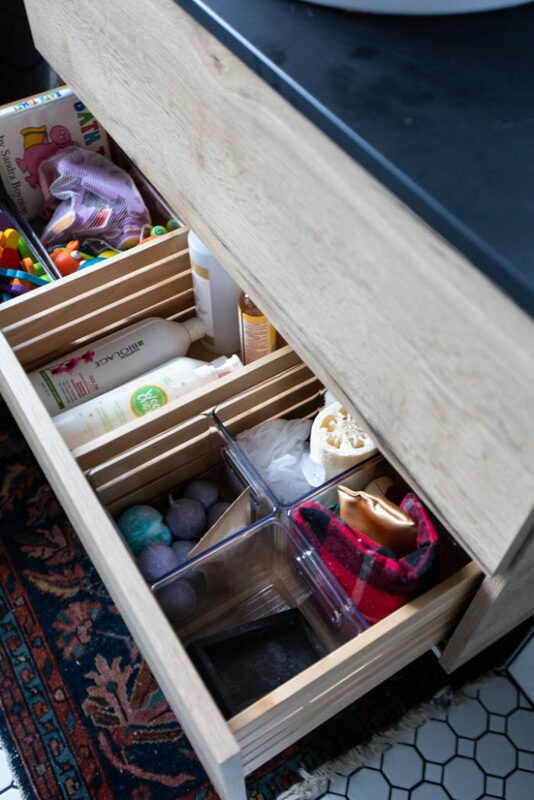 For example, this bathroom vanity drawer is full of all our bath items, but the kids toys are compartmentalized further into toys, and foam letters. The shampoos and bubble baths are all in the centre because they are similar sizes. 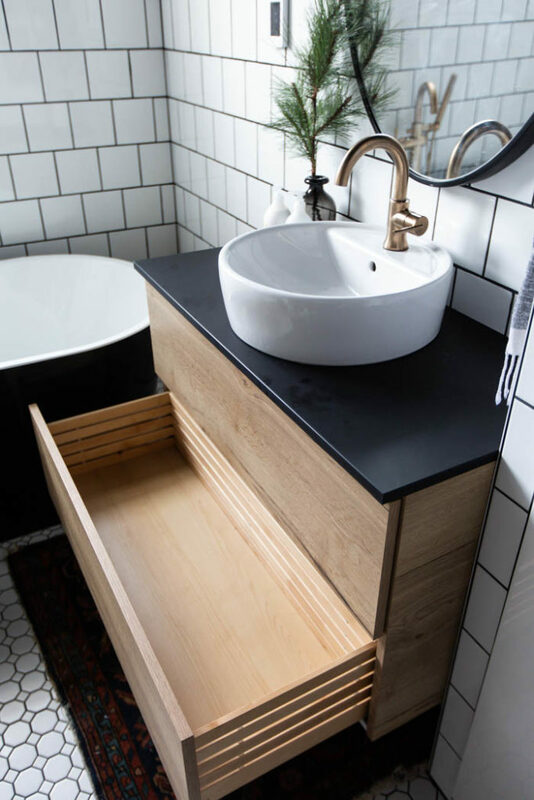 And the tall square containers that fit so perfectly into the drawers are being used to separate various bath accessories. Here’s another example of the above. 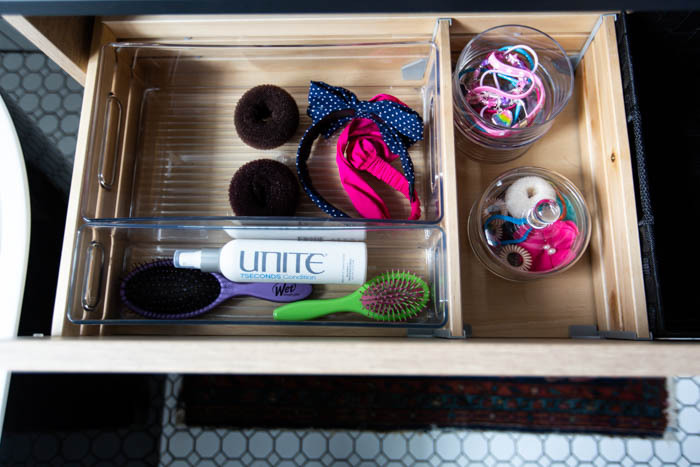 We always do my daughters’ hair in the mornings before school at this mirror, so have their hair accessories separated into similar sized bins in the morning is KEY to functioning well for us. 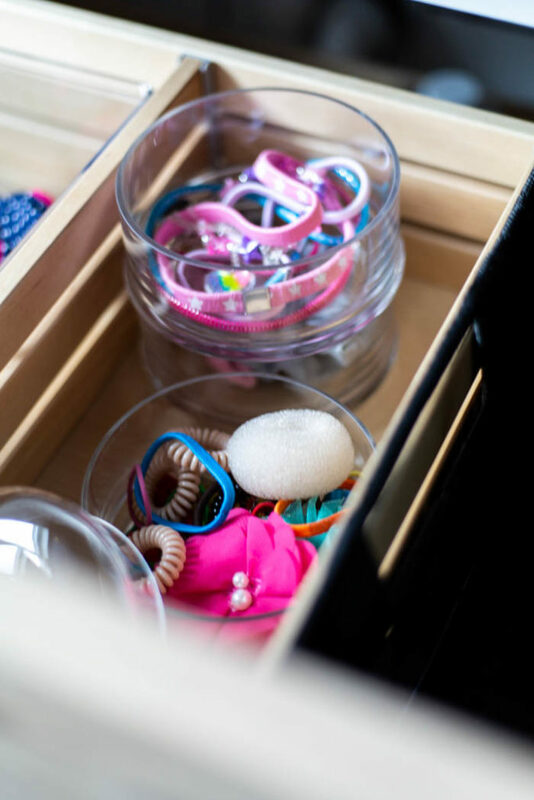 We put their hair elastics into these small containers that are easily removed so that we can bring it out, search out the very specific hair elastic colour of the day, and easily put the containers back in their home. If you’re wondering why there is an empty basket in the vanity, that’s our new “guest basket”. This is the main bathroom that our guests will use when they stay, and I want them to have a dedicated place to put their toiletries, etc. 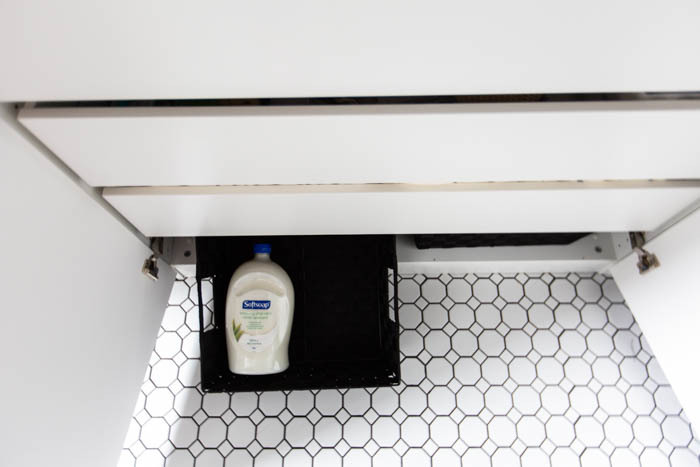 when they are here – especially since our countertop space is limited. This stylish basket fits perfectly and easily defines the space for them. I filled by drawers with these clear plastic containers and I LOVE it! 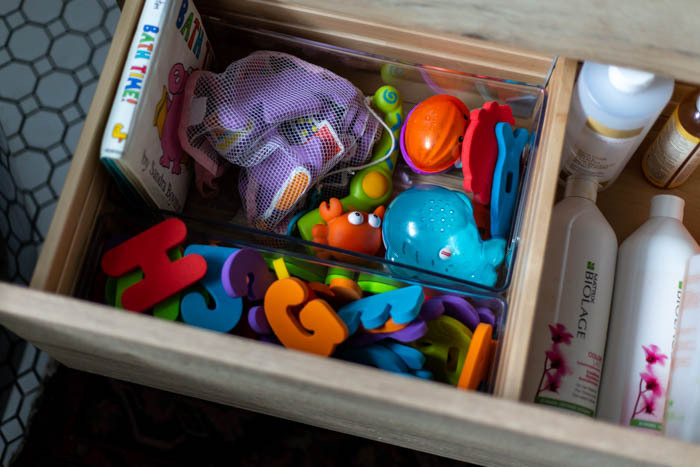 Clear plastic or glass, bins and boxes make it so that you can see everything in your drawer, while still following tip #2 and compartmentalizing. I used to have these same items in a couple of black bins. It looked nice, but I confess that I found about five children’s Tylenol boxes, and more than five Polysporins. Don’t be like me and buy the same thing over and over again, lol. 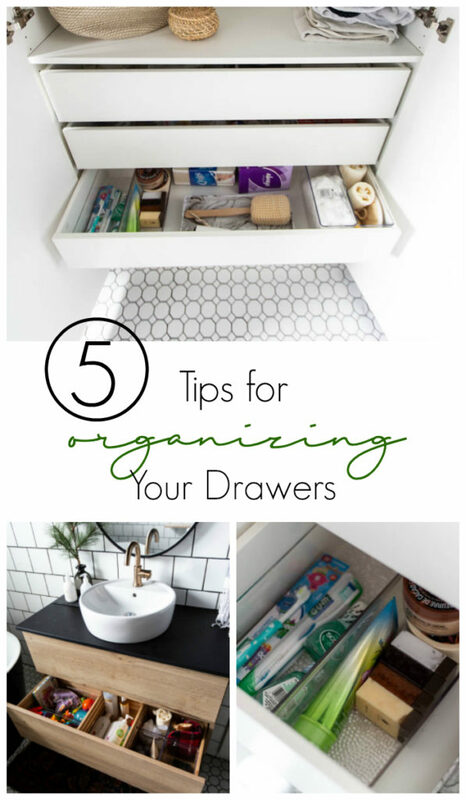 It seems counter-intuitive to put open boxes and containers in your drawers, but when you do, you know exactly how much of everything that you have! It also makes it easier to see what it is. 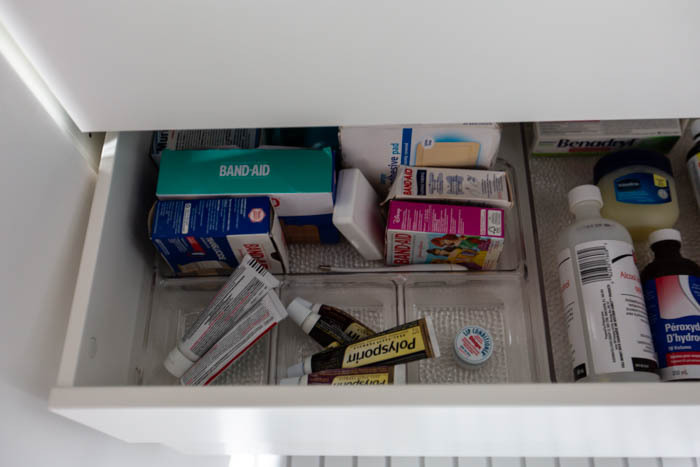 For example, there are several bandaid boxes in the drawer below, but it’s hard to tell from the boxes what shape they are or which type of bandaid, and it’s impossible to tell how many are left. Clearly I still have one area to declutter! 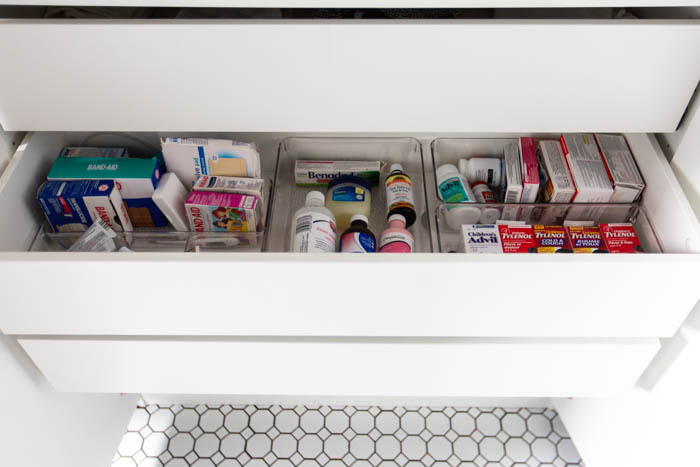 There are two drawers in this cabinet, one with bins for medicine and medical supplies, and the other with extra guest supplies. 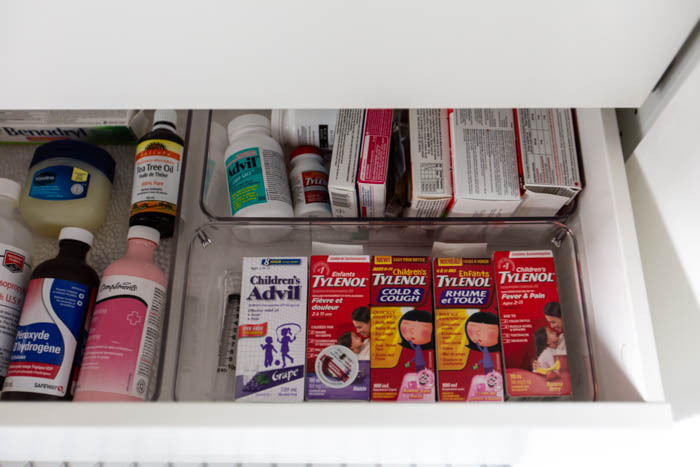 Clearly, I’m going to be using the medicine drawer more often (heck, I have three kids and opened that drawer twice today already! ), so I put those objects in the top drawer. 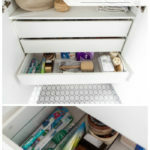 I also stored the everyday things, like hair brushes, in the vanity top drawer, where it’s even more easily accessible. And then there was that tiny unused space at the very bottom of our cabinet. 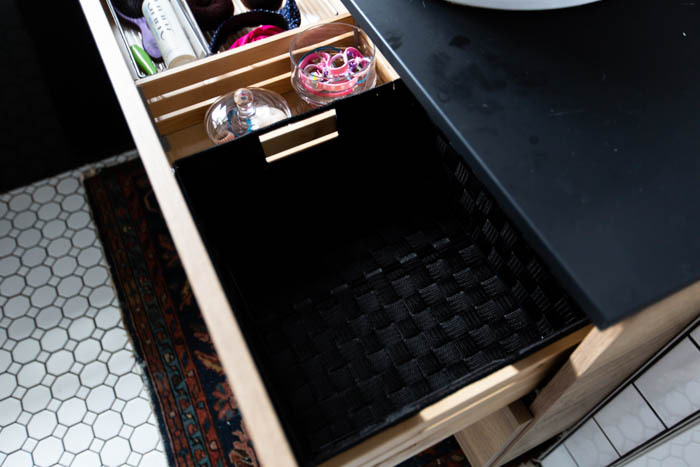 It was driving us crazy that we weren’t utilizing that space properly, but then I found these black baskets that fit PERFECTLY in there. I’m using it to store the things that we only use once a millennia, cause no one wants to reach down there every day, lol. Since we did organize this guest drawer, I’ll show that off quickly too. This is where we store all of the guest essentials, since this is the main guest bathroom as well. 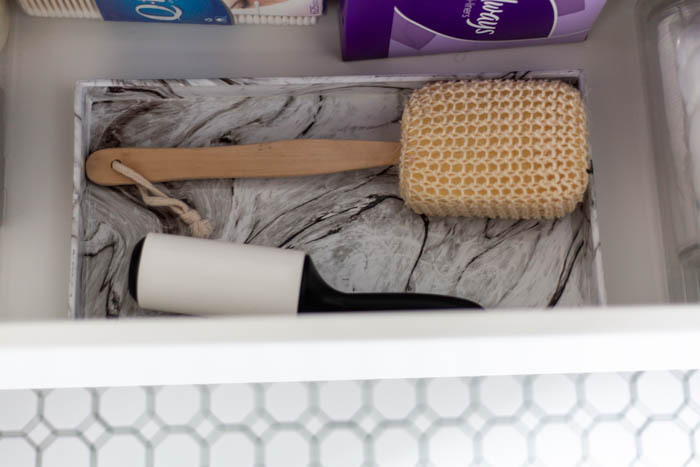 The cute marble tray is currently housing two things that I need in easy reach: a display brush (that I use to stage bathroom photos! ), and a hair roller…. cause we have a dog, lol. 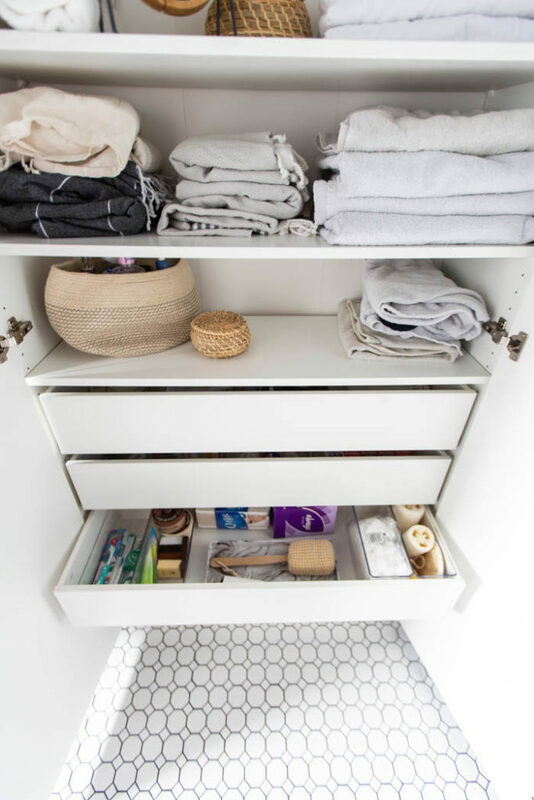 Are you motivated to go tackle your own drawer organization now? I’d love to hear if you found this helpful at all! 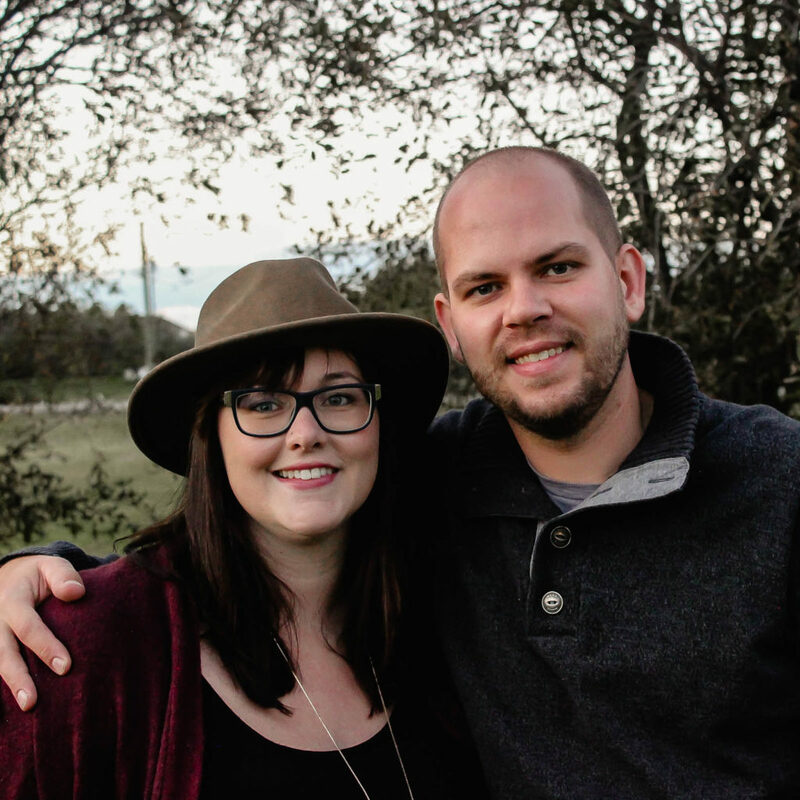 Don’t forget to check out the other rooms that my Modern Handmade Home friends organized! 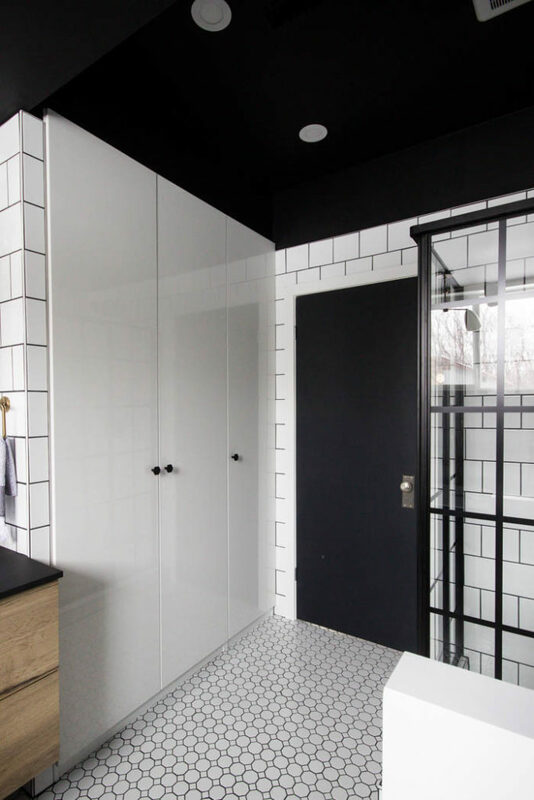 Don’t forget to check out the rest of our Modern Bathroom Renovation! Thank you for sharing the post! I will definitely try it.